While a great many have undertaken to read St. Louis de Montfort’s masterwork, the Treatise on True Devotion to Mary, very few can claim to have mastered its riches so well that they not only live its teaching in a deeply authentic and powerful way, but are also able to communicate its essential truths to others with clarity, simplicity and effectiveness. Fr. Joseph Mary Dayet of the Company of Mary was such a person. Drawing upon the grace-filled wealth of a life spent serving the Church as a son of St. Louis de Montfort and the depth of his own prayerful living out of his total surrender to Our Lord through the hands of Our Lady, Fr. Dayet presents the full richness and deep significance of the spirituality of Total Consecration with the penetrating insight of a fine theologian and the practical wisdom of an accomplished spiritual director. 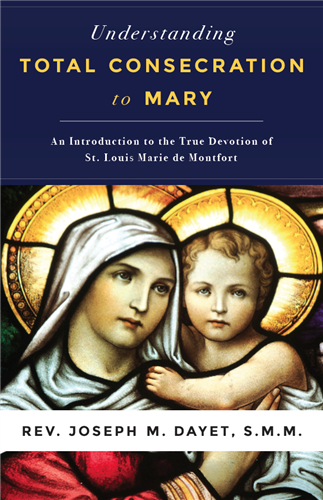 In doing so he has produced a work of great importance for all who desire to grow into the full maturity of the Marian spirituality of Fr. de Montfort.